The first time I ever heard of a hedge maze was in the pages of the fourth Harry Potter book. Ever since then I've always dreamed of getting lost in a huge maze with nothing but my wits to help me escape. When the National Building Museum revealed their annual summer project in 2014 was a maze I had to go. Even though it was short an easily solvable there was still the thrill of turning each corner unsure if you would find the center or another dead end. What is it about getting lost on purpose? Why is that a situation we put ourselves in? Life is already confusing enough, yet people spend hours crafting mazes and puzzles to trick us. Every time we step in a maze we are giving ourselves over to a grand design that while confusing is beautiful and orderly. Are mazes our way of navigating the profound confusion that life brings? I hadn't planned to go this far north of the city but as soon as my friend Attiya told me about this labyrinth garden I knew I had to change my plans. When traveling you have to create time and space to stumble upon and explore places that weren't initially a part of your itinerary. As I made my way up to the park I stumbled across "corporeal poems" created by the artist Joan Brossa. The ground was littered with deconstructed symbols of language. Letters broken by some great explosion, a question mark that looks as if it has been guillotined. I really loved how the artist made language and its deconstruction/reconstruction visible and somatic. 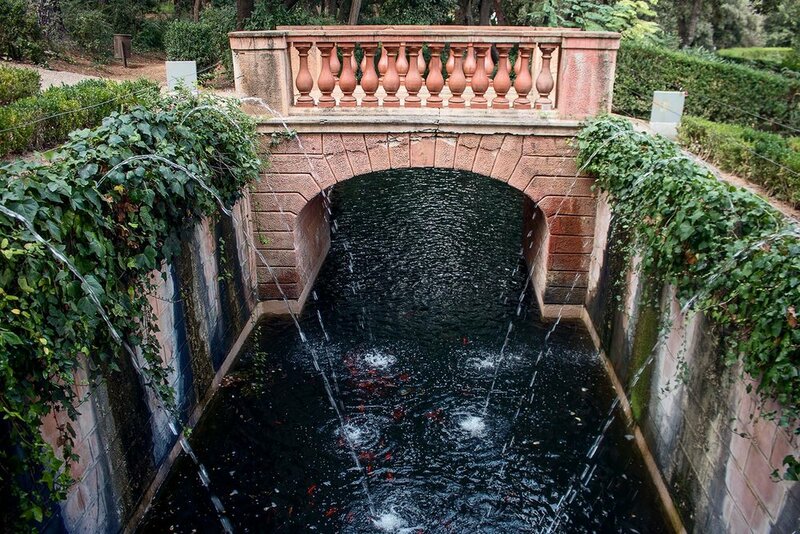 The Labyrinth Park in Horta, Barcelona takes the honor of being the oldest garden in the city, work began on it in 1791. It only costs about 2-3 euro's to enter everyday except Wednesday's when its free. While the maze is the highlight with the center, above, containing a statue of Eros- the Greek God of Love, there a lot more to see. The maze is a short endeavor but surprisingly tricky. I made it most of the way but kept getting confused on a confusing three-way turn. Eventually I realized my mistake and made it to the center. The statue is framed so beautifully among the hedges. I sat for a while before completing the rest of the maze. Once you get past the maze there is more gardens and architecture to see and explore. The entire grounds is gorgeous and well worth the cheap entry fee. Its a fun place to come with friends and family or to explore by yourself and get lost with your thoughts. I can't wait to come back here again and have a photoshoot among the grounds.